View More In Bags, Cases & Sleeves - Page 2. The Galaxy Tab E 8.0 Case is designed with both protection and functionality in mind. It also includes a fantastic kid friendly look and feel. This case is a dual layer design with molded high grade polycarbonate and thermoplastic polyurethane for shock absorption. This provides maximum protection from major and minor drops for your tablet. The handstrap is fully adjustable to suit different size hands and rotates 360 degree for different viewing purposes. It also has a built in kick stand for hands free viewing. All ports and buttons are accessible through the cover. Designed with ease of installation in mind, simply remove the front plastic faceplate and peal back the silicone cover. Insert your tablet, reverse the process, and enjoy! Material: Made of a dual layer design of both hard plastic poly-carbonate interior and wrapped in layer of soft silicone gel which is soft to the touch. Features: The Galaxy Tab E 8.0 case has a rotating adjustable hand strap and kickstand in the back. (Shoulder Strap IS NOT INCLUDED.) All cable ports, speaker, and camera have cutouts into the design of the case to be easily accessible. Both power and volume button are accessible without removing the case. 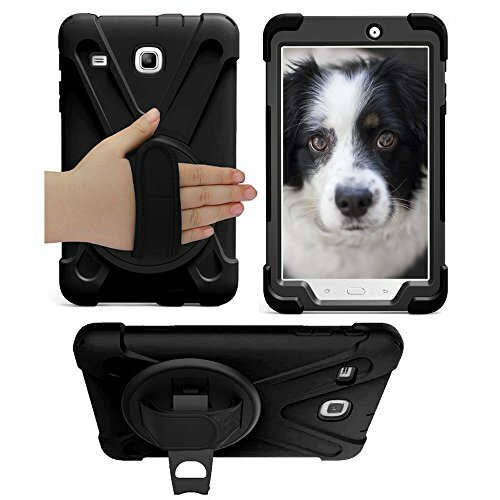 Functions: Provides extra shock-absorbing, dust-repelling, skid-proof, anti-fingerprints, and anti-scratch protection. Manufacturer Guarantee: We know you'll love the way your tablet holds up in our case. If if you're not 100% satisfied for any reason whatsoever, KIQ will replace or refund your purchase! If you have any questions about this product by KIQ, contact us by completing and submitting the form below. If you are looking for a specif part number, please include it with your message.